Welcome to the worlds greatest guide to Women's Cotton T-shirts. 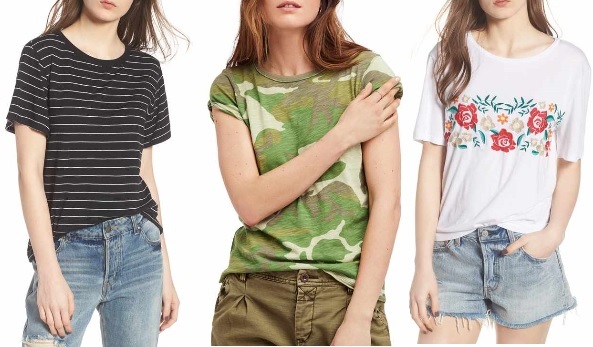 Are you actually looking for Women's Cotton T-shirts? Well, we hope you are because the reality is that you have found our page on the topic. In this women's clothing section of the Apparel Search directory, you will find all sorts of interesting information regarding ladies cotton t-shirts. Why do we love t-shirts so much? T-shirts are generally made of a light, inexpensive fabric and are easy to clean. They are functional and can be fashionable. Easy with a pair of jeans and versatile with several other outfits. Certainly a simple go to garment for every wardrobe. A T-shirt is a type of shirt named after the "T" shape of its body and sleeves. It generally has short sleeves but can be produced as a long sleeve as well. The neckline is common as a round neck (crew neck) and v-neck. 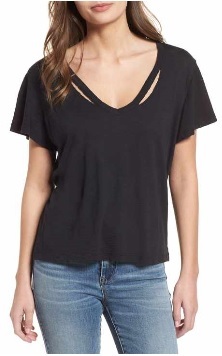 A V-neck T-shirt has a V-shaped neckline. If you have not already guessed, a round neck has a round shape around he neck. Yes, your head pops up thru the neckline. Some t-shirts get a bit more creative. For example this split neck t-shirt. This type of shirt does not have a collar. The garment typically extends to the waist but can be produced to various lengths. They can be made rather boxy or fitted. T-shirts that are tight to the body are called fitted, tailored or baby doll T-shirts. The T-shirt evolved from undergarments used in the 19th century and, in the mid-20th century, transitioned from undergarment to general-use casual clothing. A 1990s trend in women's clothing involved tight-fitting cropped T-shirt or crop tops short enough to reveal the midriff. T-shirts are often printed with graphic designs. They can also be embroidered or embellished in other ways. The most common form of commercial T-shirt decoration is screen-printing. Dyeing fabric for solid color garments is also very important to the market. Tie Dye is a trend that comes and goes. The method existed for centuries, but was introduced more prominently in the United States in the 1960's during the hippie movement. Cotton Cotton is a soft, fluffy staple fiber. The fiber is most often spun into yarn or thread and used to make a soft, breathable textile. The fabric is often used to make fabulous ladies tees. Learn more about the benefits of cotton. Apparel Search is a leading guide to fashion, style, clothing, glam and all things relevant to apparel. We hope that you find this Women's Cotton T-shirts page to be helpful. What ever style of tee you are wearing today is completely in fashion. If you want to be even more stylish, you should wear your favorite cotton t-shirt. Learn more about Cotton or Organic Cotton from the cotton definition page or read more about the benefits of cotton clothing in the cotton news section. Learn more about women's cotton fashion.